by Frances Lennard, Professor of Textile Conservation. I’m delighted to be able to give news of this year’s prizewinners. We are very grateful that The Worshipful Company of Woolmen, one of the oldest of the Livery Companies of the City of London, has continued to support us this year. 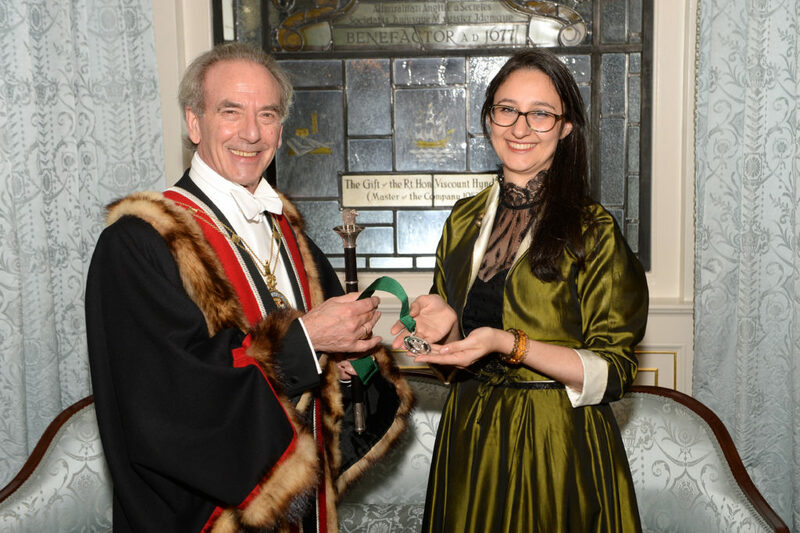 The Silver Medal 2017 was awarded to Keira Miller at the Civic Dinner in London on 25th October. Christopher Thierry Master Woolman presenting Keira Miller with her award at The Worshipful Company of Woolmen’s Civic Dinner 2017. © The Worshipful Company of Woolmen. The Karen Finch Prize was established in 2015 to mark the 40th anniversary of the founding of the Textile Conservation Centre by Karen Finch and Karen’s role in developing textile conservation education. It is awarded annually to a graduating student; this year we were very pleased that the prize was shared by two students: Beth Knight and Bevan O’Daly. 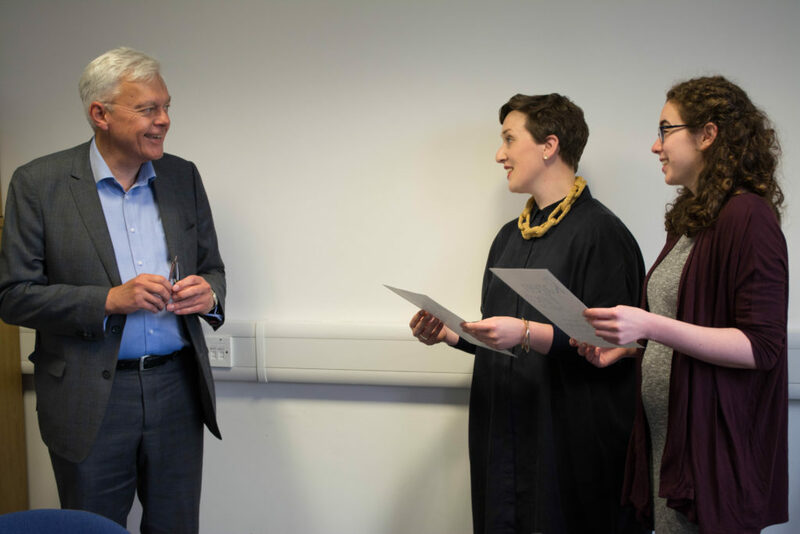 Professor Nick Pearce, Sir John Richmond Chair of Fine Art at University of Glasgow, and a Trustee of the Textile Conservation Foundation, presenting Bevan O’Daly and Beth Knight with their prize certificates. The Weavers’ Society of Anderston, part of the Trades House of Glasgow, also supports us each year by offering a prize to one of the students to mark overall progress at the end of the first year. 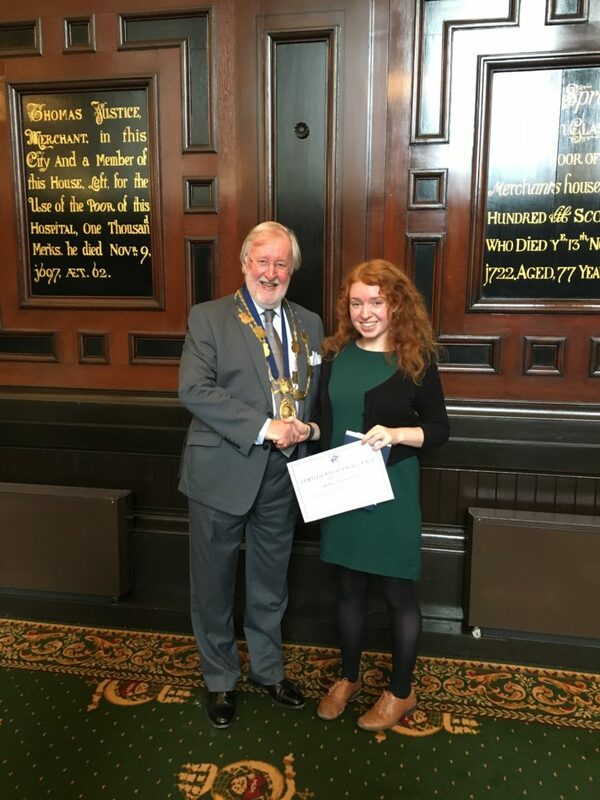 This year the Certificate of Excellence was awarded to Rebecca Doonan at the Weavers’ Society’s annual lunch in the Glasgow Merchants House in September. We are extremely grateful to these organisations for their support, and to be able to recognise the hard work and excellent progress made by all our students, but particularly by Keira, Beth, Bevan and Becky in the past year. So pleased to see the recipients of the prizes, especially the Karen Finch prize. Congratulations to all, and the staff and Frances Lennard for the continuation of the Textile Conservation Centre at Glasgow.